With his big group of exceptionally happy owners on course to cheer him on, it was good that Amerock chose Sunday to stick his nose out for a home-track victory in the 2000m BM64 contest. Wildly applauded back to scale, the consistent four-year-old is much loved by his connections including manager Mark Hoare and his breeders, the Bamford family. Thought highly enough of at three to contest the Listed Morphettville Guineas (finishing a game third having worked early from a wide gate), Amerock has been with us with four starts and it was great to be part of such a highly appreciated victory. 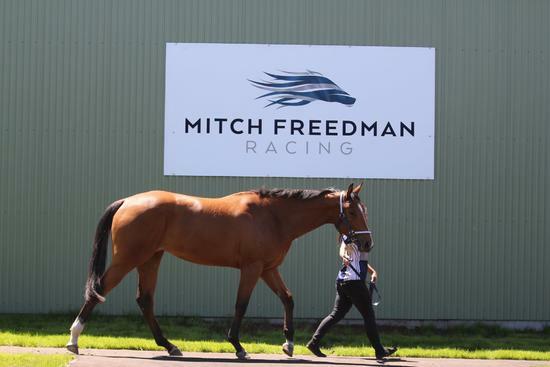 "It is enjoyable to get a winner for good people," Mitch Freedman said. "The horse is going really well," he said, adding that "he had a little bit of time between runs - he got a bit crook so we let him get over that." "He had a jump out here on Tuesday and went well and it was a nice ride by Jarrod." Allowed to find his feet in a truly run race, Amerock settled towards the rear, hooking out into the clear turning and making a long run. From the 200m it was just he and Celebrity Reign fighting it out, our boy showing plenty of courage to get the upper hand late. It was win number three from 20 starts for the son of the Melbourne Cup hero Americain who has also finished in the placings on five occasions, amassing not far short of $100,000. He is the second runner and first winner for the unraced Zabeel mare Miss Shamrock, daughter of the Gr.1 Australasian Oaks winner Irish Darling who has also produced the Listed winning stallion Fighting Sun. Also able to boast amongst her relations the stakes winners Twist Tops and Dragon Maiden, Miss Shamrock was served last spring by Merchant Navy having foaled a Pride Of Dubai colt in early November.